According to the likes of The Guardian and Business Insider, GOP presidential front-runner Donald Trump changed his stance on U.S. wages over the weekend. In fact he didn't, but mainstream media was all too happy to jump in and say so. It started with an attack Vermont Sen. Bernie Sanders fired at Trump on CBS' "Face the Nation" yesterday. "[Donald Trump] has said that he thinks wages in America are too high," Sanders proclaimed on Sunday's broadcast. That's when the mainstream media stepped in to accuse Trump of "doing a one-eighty." Business Insider published a piece this morning entitled "Donald Trump Changes Tune on Wages After Bernie Sanders Broadside." The Guardian claimed earlier today that "After Sanders Criticism, Donald Trump Flip-flops: 'Wages Too Low.'" And CNN posted the following: "Bernie Sanders: Why Trump Voters Should Back Me." The truth is that Trump's wage comments have long been taken out of context – this is just another example. During Nov. 10's fourth GOP debate, Donald Trump claimed that "wages were too high." But he did so in response to a question about whether he was sympathetic to protesters who have been pushing for the minimum wage to be raised to $15 an hour. To which Trump replied, "I can't be… and the reason I can't be is because we are a country that is being beaten on every front." He then went on to say he believes taxes and wages are too high and, as a nation, we can't compete against the world. GOP front-runner Donald Trump seems to grow more popular with every bombastic remark he makes. Does his knack for working an audience and garnering headlines make him the president we deserve? "I hate to say it, but we have to leave [the minimum wage] the way it is. People have to go out, they have to work really hard and have to get into that upper stratum. But we cannot do this if we are going to compete with the rest of the world. We just can't do it." On Nov. 12 – two days after that debate – FOX News' "Special Report" host Bret Baier asked Trump about his controversial wage claims. Exasperated, the billionaire businessman again stated, "I didn't say that. Bret, we were talking about the minimum wage, and they said 'should we increase the minimum wage?' And I'm saying that if we're going to compete with other countries, we can't do that because the wages would be too high." He then repeated, "I was referring to the minimum wage." The business mogul went on to explain that people say they want to increase the minimum wage because it sounds good politically, and even though it's hard for him to say, he had to stand strong on not raising the minimum wage because "our country is losing businesses." 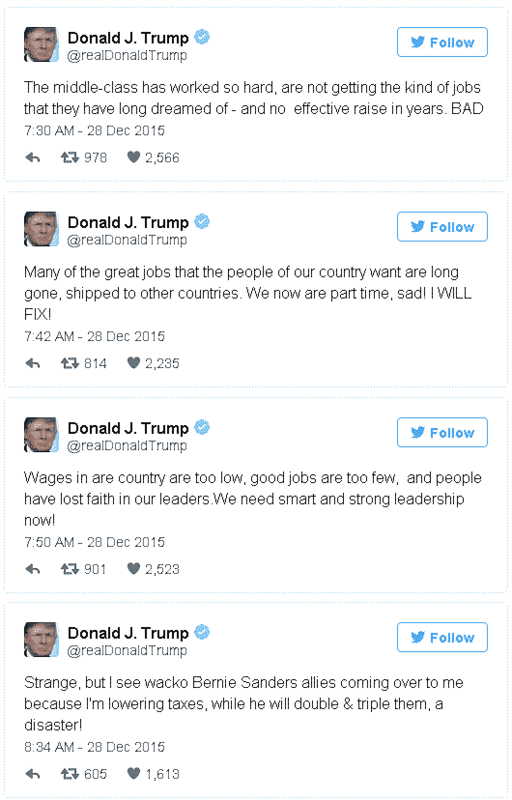 How do you feel about Trump's wage comments? Tell us on Twitter @moneymorning or like us on Facebook! Most 'western' nations are finding it hard, this is because Corporations have off-shored manufacturing jobs for bigger profits. We can't compete with cheap slave manufactured goods without taxing them, for job protection. If each nation relied on it's own produce and only 'traded' in what was needed, there'd be a lot of happy people in the world. As it is, the only people with a smile are the Corporations and Bankers. Saying that, the US has never really succeeded in exports, especially cars, to expensive and food which has been played with! The beautiful thing about Donald Trump is he says things no professional politician, for fear of losing a vote normally gotten by pandering to the populous, would dare say. For this reason alone, he becomes a breath of fresh air we haven't seen since the likes of Harry Truman. The truth often hurts …and that's why 'political correctness' and 'feel goodism', which ignores truth, was adopted…and the result is worthless 'garbage' causing a 'cancer' in America's core values. Setting minimum wages is strictly to buy votes from ignorant people. In effect it says "any job that is not worth the minimum wage will be left undone or will be done illegally". "Fair wage" should be between a willing worker and a willing customer (employer); The government should have no say in the matter. I think Donald would make an excellent president — he knows business and this country is one big disaster. He has certainly proved his due diligence — and he obviously has very good people around him to help with his success. Obama will go down in history as the WORST president the US has ever had. I'm not so sure that Trump will make an excellent president. He will certainly make one hell of an interesting president. Given the alternatives he may well work out being the least worst choice you have. As for Obama being the worst US president in history, you must have an extremely short memory. How the American people could allow that moron GWB to become President is just beyond a joke and then to allow him in again for a second term, you Americans deserve every thing he gave you, or was that stole from you. Trust me the world is still laughing their heads off at the stupidity of the system you guys have got that allowed him back in. Have Americans never heard of conflict of interest. Which ex Vice President was it that made himself (and his mates) stupidly rich by going to war over in Iraq. I feel so sorry for all the service men & women that gave their lives and futures so Halliburton, etc could make sqillions while it drags the rest of the country into a financial black hole. As for Obama at least the guy is articulate and intelligent and can give a 15 to 20 min speech off the cuff without uming and arhing once. You may not like his policies or the way he does things but considering that neither the congress nor the senate are prepared to work with him for no other reason than there is this toxic, poisoness hate between the 2 political teams are you really surprised that everything is so messed up. The world just can't believe how a society that is so advanced and intelligent and has achieved so much in the last couple of hundred years can allow themselves to be set on a path of self destruction. The most unfortunate part of it all is that the US is so big that we are all going to suffer for your incompetence. Yo'all only have yourselves to blame! Sorry but the minimum wage really is too low having lost in real terms more than a third of its value since the mid sixties. Nobody could possibly support a dependent on 7.25 an hour without food stamps, the Earned Income Credit, energy assistance and food shelves and other private efforts. As for the alleged tripleing of taxes Bernie Sanders is again allegedly advocating not even Trump could be subjected to it without harming the Bill Gates's, Richard Bransons, Mark Zuckerburgs and other billionaires who have really, really improved our lives and deserve their riches, a pity. The press has taken on the skills of the Democrat Party. Alter the truth until the fits the purpose of the teller to damage the opposition. Honesty is never destructive enough. In 1934 the FDR-Democrats were challenged by Edwin Witte, author of FDR's two main legislative Bills, Old Age Insurance and Government Healthcare to be patterned after Kaiser Wilhelm's plan for Government controlled Healthcare insurance. That program so strengthened Socialism into NAZI power that Adolph Hitler and his Gestapo Police were able to start stealing freedom and independence from Europe causing World War II. It appears that the Democrat-Socialist Politic is actively pursuing the identical pursuit of Fascism to destroy US and our Constitutional Republic. I spent a half hour writing why Donald is the only person running for President who can actually turn around this mess (we are running out of time and Hillary hasn't a clue and neither do most of the Republicans. No one should be allowed to even run for Office without 1st having 15 years experience in th Private Sector and preferably in companies of no more than 20 people and rise to management during that 15 years. PERIOD! IF my earlier letter just disappeared here it may be that you guys got it –it is one of the best letters you will ever read (I'm 89 years old and still work 50 hours a week and have been self-employed since age 36 –that is a reality that few other than family farmers have ever succeeded in surviving-that reality. Increasing the minimum wage will not increase to the maximum effort. Donald Trump has a proven record of success, success in summing up people and situations, success in negotiating skills, success in money management, success in motivational skills, success in getting things done below budget and in a shorter than estimated time. None of the other candidates come close. He is a billionaire because he is no dummy, he has proven that he knows what he is doing.Give him the opportunity to rebuild the greatest nation on earth and make it even better and stronger than it has ever been.